Phungo Readers Hall of Fame - Tommy John - REJECTED. How about David Cone? A few weeks back I ran a poll to see what my readers opinions were on Tommy John as a Hall of Famer. This was the 2nd Phungo HOF poll. In the first Jim Rice recieved a thumbs down. 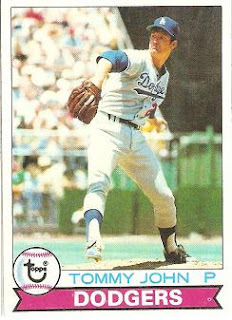 Once again the Phungo readers have spoken and Tommy John was also rejected, and by a larger margin. His 288 wins (294 including post season) were not enough to persuade Phungo readers of that John is Hall-worthy. There were 4 "Yes" votes and 9 "No" votes for John. I had one other voting category not present for BBWAA writers, and that is to Defer a vote - one person chose this option. I based my Yes vote on a few things. 288 career wins, He pitched for 5 playoff teams in the pre-wild card era (note 1 NLDS in 1981 strike season), and in 3 World Series. He may have come up short in all 3 of those series but I think getting to them is also important. And lastly I believe that he deserves at least a minor bump for being the first athlete to successfully pitch after receiving the surgery that now bears his name. This small Phungo vote (30.7% for) was remarkably close to the final Hall vote (31.7%). The Tommy John vote also generated less interest than the Rice vote (14 cumulative votes down from 26 for the Rice Vote). There were no reader comments regarding the Tommy John vote either. If Phungo is still alive a year from now I will try and bring up the vote again. It will be interesting to see what happens to Tommy John in these limbo years between the writers ballot and the Veteran's ballot. As far as card collecting goes, recent sales of Tommy John's 1964 Rookie Card (Topps #146) were in the $6 to $6.50 range for ungraded cards. Completed auctions for low-end Tommy John autograph cards are in the $5.50 to $6.00 range. I am going a totally different route with a new HOF poll. We are examining the career of David Cone. Cone has nearly 100 fewer regular season Win then Tommy John, but has a pretty solid post season resume 8 wins, 3 losses, 3.80 ERA. (2.12 in 6 World Series Games) and hist teams were 12-3 in 15 Post Season Series including 5-0 in the World Series. Cone was flat out rejected on the writers ballot, receiving less than the 5% minimum to qualify for future votes. I am not sure that he is HOF material, but I think it is a pretty weak that he did not get the requisite 5% to keep him on the ballot. I wanted to get this post out while the WBC was still being played, specifically when Puerto Rico was playing. The Clemente's story is well documented. At the time of his untimely death the career .317 hitter had just recorded his 3000th hit. He was a 15 time all-star, who won an MVP award. He spent his entire career as a Pirate and was a member of both the 1960 and 1971 World Series Championship teams. This the Phungo card for Carlos Delgado. His card number is 21 to match his uniform number which he wears to honor the memory of fellow countryman Roberto Clemente. A few months back I ran a column on the film "Grand Canyon" and its connection to Roberto Clemente, you can read this entry here. Jamie Moyer has been a terrific addition for the Phillies the last two years. He is a local athlete who grew up in the Philadelphia suburbs and played his college ball at St Joes. Through perseverance and a lot of hard work he has carved out a 22 year career without having what would be termed "devastating" stuff. In 2009 he got to live the dream; he pitched in the World Series for his home town team and won. Moyer signed a two year contract this off-season, if he pitches through the life of the contract he will pitch in four different decades. His career record is 246-185. That is 61 games over .500, which is comparable to recent retiree Curt Schiling's 70 games over .500. This picture was taken during a September 11th game versus the Milwaukee Brewers. This game was essentially the game that kicked off the Phillies memorable playoff run. Going into the game, the first of a four game series versus the Brewers, the Phils were four games behind Milwaukee for the wild card lead. The Phils won the game then went on to sweep the series. The four wins were the beginning of a 13-3 Phillies finish. The Phillies, of course, remained hot and went 11-3 in the Playoffs to claim the World Championship. For the additional (and extensive) Team Phungo coverage of this game click here. Jamie Moyer has become quite the folk hero here in Philadelphia. He is great to the fans, interviews well, and was a key player for the World Champions. That made him an easy pick for the cover of the Phungo card wrapper. I am sure Moyer won't be offered many coverboy opportunities, so that was another reason I elected to put him on the cover. Folks who I have sent Phungo Cards to have gotten a B&W wrapper, since I was to cheap to print a color one - here is what the color wrapper looks like. I initially sent these out to anyone I traded with last year or received cards from via a contest or blogfriendships. I have appreciated the many great comments and reviews that the Phungo cards have gotten and fully plan on putting together a 2010 set. Curt Schilling announced his retirement via his website today. He has had an excellent career, but I like most Phils fans have mixed emotions about Schill. The Phils won and NL Title with him and then had to jettison him from a poor team. 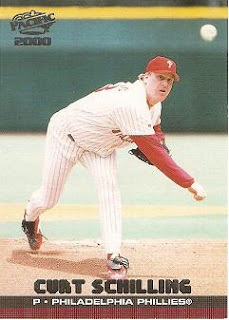 He spent more time with the Phillies then he did on either team for which he won the World Series. Schilling is now retired, not sure he stays retired......But one thing I am sure of, even if he remains retired, it won't be the last we see and hear from number 38. I am sure he will show up on plenty of TV and Radio. Tip off to American U v Villanova. Philadelphia Hosted six games for the first two rounds of this years NCAA tournament. The participating teams were BYU, Texas A&M, American University, Tennessee-Chattanooga, U Conn, UCLA, VCU and local favorite Villanova. The Head coach to the 1985 Champion Villanova Wild Cats Rollie Massimino. The NCAA Tournament is always a fun event, if an opening round comes to your area and your a hoop fan I suggest you try and find your way to a session. Tomorow Villanova plays their first game in the 2009 NCAA tournament. Scottie Reynolds will be leading the Wildcats at the point guard position. Above is the sole basketball card in the Phungo 2009 collection. Scottie Reynolds is the featured player, he is a point gaurd (PG) who has an outside chance of making it into the NBA. I chose Michael Jordan's number 23 as the basketball card number for the Phungo Set. The card is bordered in dark blue to match Villanova's team colors. The picture was taken during a game at Philadelphia's historic Palestra. The Palestra is the Home for Penn Quaker's basketball and several big five/city six contests between the six Philadelphia college basketball teams; Nova, Penn, Temple, St Joes, La Salle, Drexel. If you're a basketball fan and you have the opportunity to see a game at the Palestra it is truly worth the effort. It is one of the oldest basketball gyms in the world and has been the site of many a great game. The list of notables that have played games there include Dr J, Allen Iverson, Oscar Robertson, Bill Bradley, Rick Barry, Billy Packer, Patrick Ewing, David Robinson, Ralph Sampson, Jerry West, and of course Wilt Chamberlain. Last Friday Burrell Posted the above letter in the Philadelphia Daily News to thank the fans of Philadelphia. Pat is off to Tampa and looked pretty sharp in a spring training game I saw him play on MLB network Monday night. Recently Dave over at Fielder's Choice had an article noting that longtime Ray Rocco Baldelli had run a similar thank you in the Tampa paper. Burrell had a long tenure in Philadelphia. I am glad things ended so well for him here and look forward to seeing him play for the Rays. To see an earlier Phungo Profile (and a Phungo Card!) on Burrell click here. 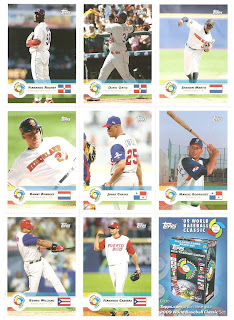 Random Observations team Phungo made during the World Baseball Classic in San Juan Puerto Rico. Puerto Rico is sort of like being in an ethnic neighborhood in Philadelphia or New York. Lots of stuff is very different and some stuff is a lot the same, many folks speak a different language but if you need somebody who can speak English you can usually find them. They use the same currency and you don't need a passport. The local delicacy is the Mofungo - Mashed Plantains which are then fried and topped with your choice of Meat, Fish or Vegetables. (I think there is a Mo Phungo joke in here somewhere) Plantains go with everything and are even used as a Pizza topping. Mofungo with Chicken or - Mofungo Con Pollo - I think. Hiram Bithorn Stadium is a loud and rockous environment. Games are as much an event as they are games. The Crowd noise rivaled that of a Major League Playoff game. Bithorn is a 20,000 seat stadium which I would equate to a large Minor league park. They have dizzy bat races and there are fireworks for the 7th inning stretch. If you want free junk they got it. Some company was giving out 64 oz bottles of household cleaner - I have fears some drunken American may have confused it for gatorade. Hiram Bithorn was the first Puerto Rican to play in the Major Leagues. Bithorn was a Right Handed Pitcher for the Cubs and White Sox for four seasons between 1942 and 1947. His career was interrupted for Military service in 1944 and 1945. I saw the Netherlands play twice, once as the Home team and once as the Away team, yet they used the same dugout both times. When they announce David Ortiz at Hiram Bithorn, they follow his name with "Big Papi"
The 375 sign in Bithorn's left field power alley was absolute death valley for hitters. I saw 4 or 5 balls caught in that very spot. Free T-Shirts are just as popular in Puerto Rico as they are in America. 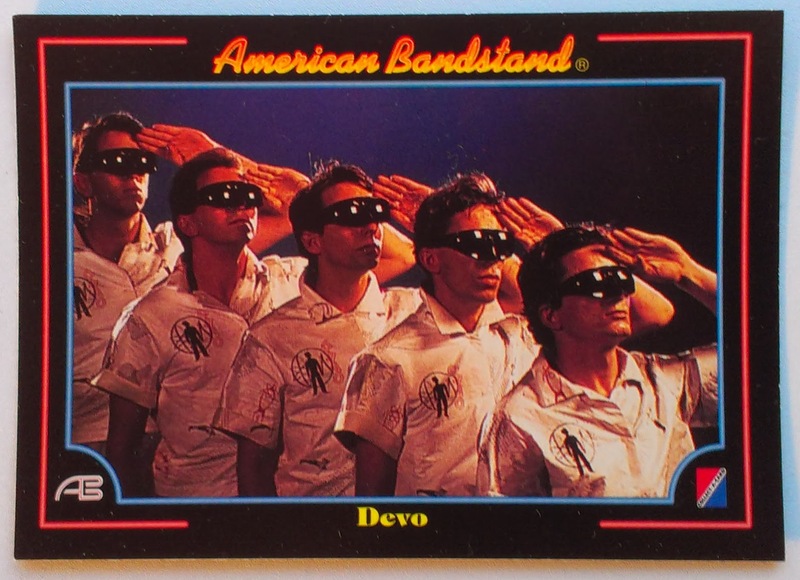 For one of the games 3 National Anthems were observed, none of which were the United States Anthem. The lines in the Mens room were so long that a vendor came in to sell beer. Concessions at Bithorn are run by Fuddruckers/Pizzeria Uno and include basically American food, but the Menu is in Spanish. The prices were more reasonable then an American stadium. $2 for a bottle of water and 2.50 for an order of fries. I think beers were $4 and they have Pina Coloda vendors. You get fans of all types at the WBC, I met great folks from all over and even shared a cab with a Mets fan. One local told me that Hiram Bithorn is not the nicest stadium in Puerto Rico. It is located in close proximity to the Airport and San Juan which makes it more convenient for big events like the WBC. 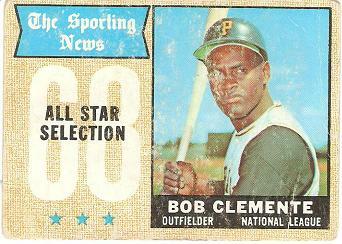 He preferred a newer Stadium Named for Roberto Clemente that was further away from San Juan. In the game in which the Dominican Republic was eliminated Big Papi played in the field, while Hanley Ramirez was DH. The Dominicans were so loaded at SS that Miguel Tejada played 3B and Jose Reyes started at short. Oh and Hanley is a pretty big man. Randall Simon was clearly the on the field leader of the Netherlands Squad. Walgreens in San Juan carry 75 card re-packs of baseball cards. they did not appear to have a regional flavour. Mrs Conley would be very disappointed w/ me... I don't think I could recall much of my High School Spanish. Near as I can tell the only Spanish I know comes from mexican food menus, beisbol cards, and Madonna songs. If you want to chase autographs or see ballplayers off of the field, the team hotels are in Isla Verde, which is supposed to be one of the nicest beaches in San Juan. This is a far more crowded stadium for the Puerto Rico v Netherlands game. Team Phungo received great tips and helpful information from many baseball fans including: Angels Mark, Nats Lisa, Lebanon Valley Carl, and locals Rafael, Nestor y Magdalena - Thanks to all of them and I hope they had as good of a time in Puerto Rico as we did. 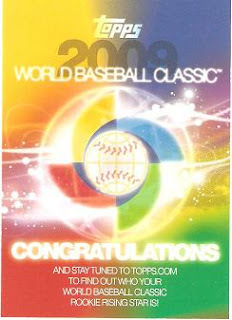 Team Phungo just got back from a few games of the WBC in San Juan, PR. Hopefully I will get more details and Photos up over the weekend. Must go unpack. Of the 9 that have not won a playoff game since then, two of the teams are relatively recent expansion teams - Texans(02) and Browns(99). And two are teams that Owens has played for the 49ers and Cowboys. In addition to being on the losing side of playoff games with the Cowboys and 49ers, Owens was also involved in the Eagles 2005 Superbowl Loss. Last year we took a vacation to Thailand to visit relatives on my mothers side of the family. It was a fun, crazy, and adventurous two weeks. I had not been there in 20 years, and had not seen my aunt uncles and cousins since my last trip in the late 80s. While there we spent a couple of days in Phuket, which is a beach resort area near the equator. James Bond Island is a tourist attraction near Phuket, It is featured in the film "Man with the Golden Gun"
I hope to take some pictures and possibly get some autos. Expect a full report when we return. Dayf from Cardboard Junkie picked up the last Spot the Sig! although I think an assist needs to go to the I Heart Halos team as they gave a pretty good hint in the comments. Nachos Grande - Reds - 1 Run in. I thank everybody for participating and intend to run Spot the Sig! again next off-season. The Braves received Casey Kotchman in the Mark Texiera deal. He is a former first rounder who has had a couple of fair to good seasons however, He has not racked up the power numbers one would want to see out of a first baseman. Perhaps that will come, he is 26 and heading into his prime years. This auto goes for under $4 on ebay and may have some upside. There are a few other of his auto cards floating around that sell for a few dollars more. The Fresh Ink series are sticker autos, but they look pretty decent because they are clear stickers. Sadly, This is the final week for Spot the Sig! However we will end strong with this Auto for a Home Run! As mentioned last week, PTBNL has this all wrapped up but almost everyone is still in this for the Runner-Up spot. And since this Auto is good for a Home Run, that gives a lot of people a chance to score a couple of 9th inning runs. This Homer is of the walk-off variety, and there is no bonus this week. Here are the Spot the Sig! standings going into the 9th inning. Here are the standings with one inning remaining. Card Buzz - Angels - 2 runs in Bases empty. Nachos Grande - Reds - 1 Run in. Men on 2nd. A Cardboard Problem - Yankees - man on first. Once again I would like to thank everyone for participating. I hope you had as much fun guessing as I had running the contest.